Groundbreaking nutritional research has identified natural agents that can help to maintain normal blood pressure levels already within normal range. Combining these nutrients with lifestyle modifications, pharmaceuticals, and regular self-monitoring provides a powerful strategy. C12 peptide derived from the milk protein casein naturally inhibits angiotensin converting enzyme. Since this enzyme can act to increase activity of the dangerous blood vessel constrictor angiotensin, C12 peptide's inhibiting effect on this enzyme can help to maintain already normal blood flow and blood pressure. Grape seed extract naturally increases blood vessel dilation, thereby promoting healthy blood flow and blood pressure already within the normal range. Available for the first time is a patented grape seed extract that contains a novel ratio of uniquely structured polyphenols. Pomegranate extract is an abundant source of highly concentrated compounds called punicalagins that function as natural antioxidants and also inhibit angiotensin converting enzyme, thus supporting blood vessel dilation and countering vessel constriction. 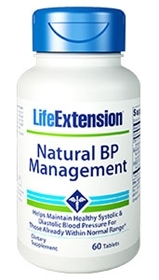 This patented extract not only supports blood pressure management, but also may provide added cardiovascular protection by promoting healthy endothelial function and maintaining healthy low-density lipoprotein (LDL) oxidation. Other ingredients: dicalcium phosphate, vegetable stearic acid, vegetable magnesium stearate, pharmaceutical glaze. Contains milk and soybeans. This product contains NO egg, fish, peanuts, crustacean shellfish, tree nuts, wheat, yeast, gluten, corn, or rice. Contains NO sugar, and no artificial sweeteners, flavors, colors, or preservatives. Take two tablets in the morning preferably before a meal, or as recommended by a healthcare practitioner. If needed, take two additional tablets in the evening. If used concurrently with anti-hypertensive medication, start with one tablet daily and adjust dosing as needed based on the advice of a healthcare practitioner.